Photograph of Scott, from the Park information board. 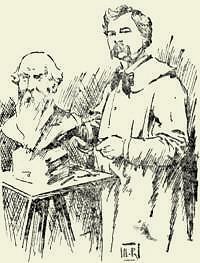 The creation of this bust was nearing completion when Cassidy's studio was visited by by the author of the 1899 newspaper article 'An Hour with a Sculptor' which have transcribed on another page - and including the sketch reproduced below. If the sketch is of the Scott bust, the final version as carved in stone would seem to have had some hair added on top at a later stage. Born in Blackburn, John Hargreaves Scott (1808 - 1881) was not, like many such leading citizens and benefactors in textile towns, involved in the textile industry or other large-scale manufacturing. He was a watchmaker and silversmith; the 1851 Census shows his premises in Market Street, Burnley where he was living with his wife Anne, his widowed mother and a servant, Sarah Elizabeth Howard. By 1861, when he was just 52 years old, he had retired, and the couple were living in 'Oak Banks' in Burnley Wood Road (now called Todmorden Road), Habergham Eaves, on the outskirts of Burnley. It appears that the couple had no children, perhaps explaining the funds available to create the Park on the death of Mrs Scott. Scott did apparently have one connection with the world of textiles. An interesting article in the Burnley Express of 12 June 2007 tells us that he was a related to James Hargreaves (1720-1778), usually credited as the inventor of the 'Spinning Jenny' a manually-powered machine which enabled one worker to spin cotton into yarn on eight spinning wheels at the same time. Most associated with Blackburn, he came from Stanhill, near Oswaldtwistle, and it was there that he produced his Spinning Jenny in 1766. Suffering from rivals who used his design without payment, and workers protesting about loss of employment, he left the area and set up a works in Nottingham. According to the newspaper article, a later Hargreaves, possibly the son or the nephew of the inventor, returned to Blackburn, where he ran a successful but short-lived textile engineering firm in the latter years of the 18th Century. 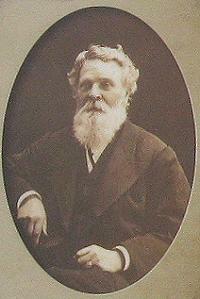 After this the Hargreaves' family moved to other towns and John Hargreaves Scott found himself in Burnley, where he ran his watch-making business for many years before, on retirement, he sold it to a David Dickinson. 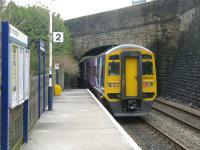 I travelled by train to Burnley on a wet day in March 2012. arriving at Burnley Manchester Road station, one of three in the town. To reach the Park I crossed the bridge in the background walked up Manchester Road which climbs steeply out of the town. I passed this empty site which has a view across the town. I almost walked past the turning for the Park, the only clue to the direction being this old street-name sign which looks as though it will be invisible in the summer. 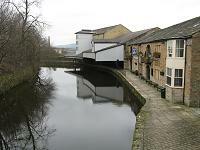 After visiting the monument I walked down into the town, pas the heritage area known as the 'Weavers' Triangle' which lies along the Leeds - Liverpool Canal, along with the textile industry a key to Burnley's growth from the eighteenth century on. There is a visitor centre, but it was not open. In the Mechanics Institute, well-known as a music venue, there is a Tourist Information Centre, which was open, and I asked it there was a Town History Trail leaflet or something similar. No, sorry - so I bought a jar of locally-made jam instead, and returned to the station. As we travel round to visit outdoor Cassidy works, it becomes clear that whilst those in bronze, provided they escape the attentions of metal thieves, have survived well, whereas those in stone are prone to damage and deterioration. 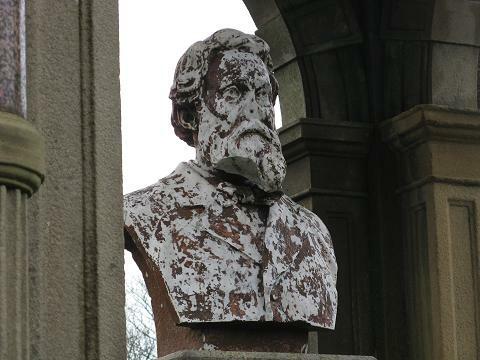 The John Hargreaves Scott bust is a case in point. Its existence escaped our notice for some years, as it appears not to have bene mentioned by earler writers on Cassidy. 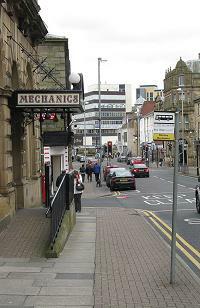 The textile town of Burnley, although it has much in common with such places as Bury and Rochdale, is well to the north of Greater Manchester, so is not included in Wyke's comprehensive book Public Sculpture of Greater Manchester. 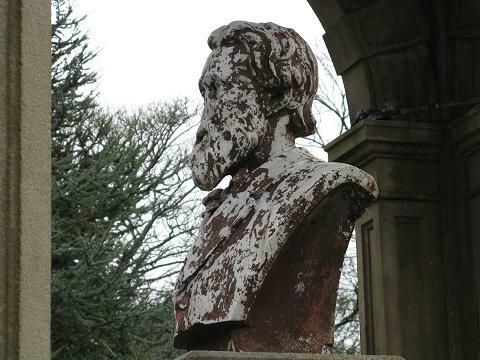 Carved from marble, the bust appears to have been painted with a brown substance at some time, perhaps to protect it, and this is weathering away resulting in the present horrid appearance. Worse, poor Mr Scott has lost his nose and half of his beard. The bust needs to be removed, repaired, and maybe replaced by a replica cast in some strong plastic material, as was done with that of Houdini (see our feature). 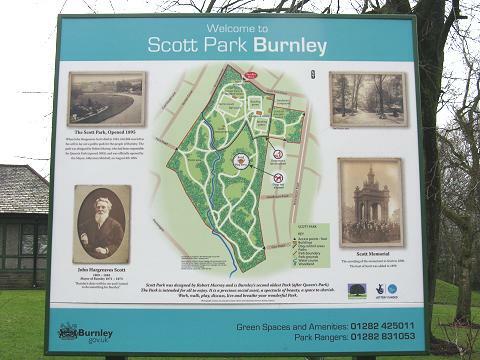 Scott Park is named after John Hargreaves Scott, a prominent Burnley businessman, an Alderman, and Mayor in 1871-73. 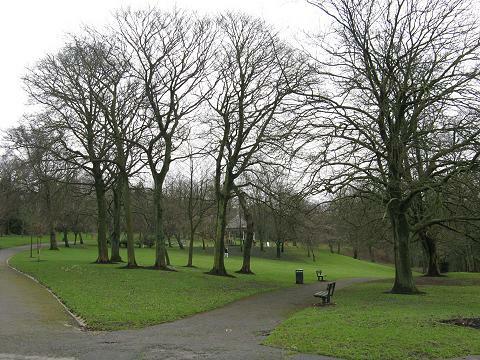 In 1880 he made a will leaving the majority of his estate to his wife, the residue on her death to be used to purchase and lay out a public Park for the people of Burnley. Scott died in 1881 and Mrs Scott in 1884. Scott's trustees, Alderman G. Sutcliffe and R.J. Hurtley eventually purchased 7.3 ha. of the Halstead (Hood House) estate to the south of the town. The design for the Park was by Robert Murray who had been responsible for the design of Queens Park, opened in 1893 in the north-east of the town. Murray subsequently became its superintendent. 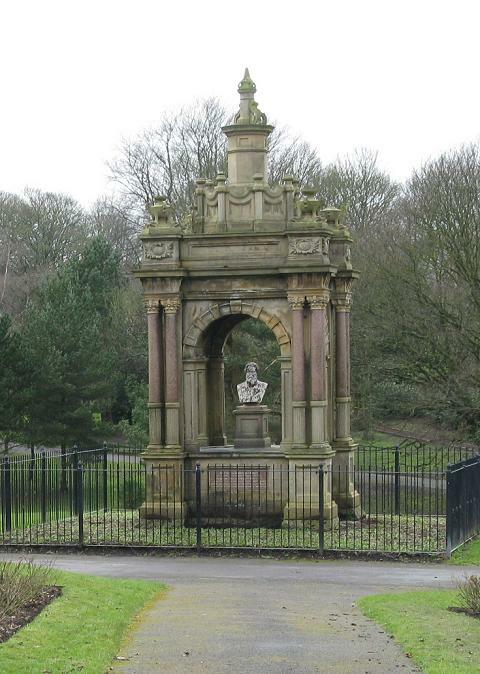 The Park was officially opened on 8th August 1895 by the Mayor, Alderman Mitchell, on behalf of the people of Burnley. A monument to Scott, designed by the then Borough Surveyor, G.H. Pickles, was unveiled in the Park in 1898. 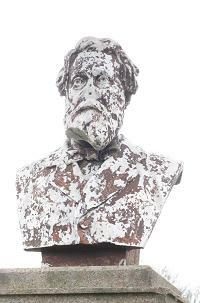 A bust of Scott, sculpted by John Cassidy of Manchester, was added to the monument in 1899. 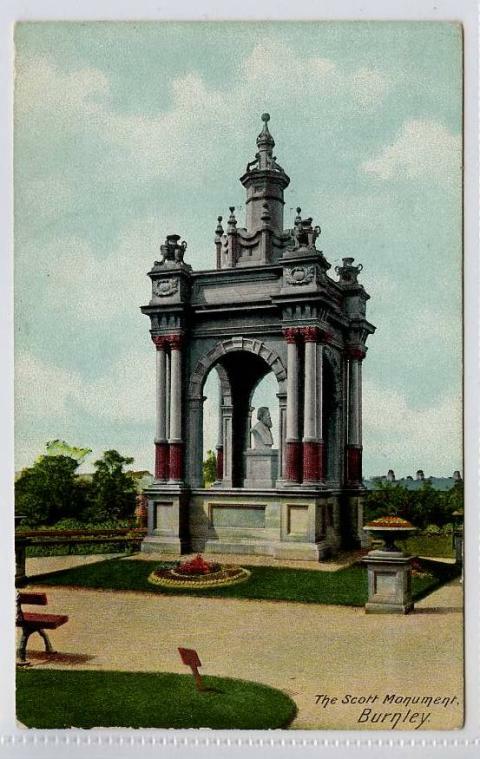 The Edwardian postcard above shows the monument in its prime. The scene in 2012. The monument has been fenced off against vandals, and awaits funds for some refurbishment. 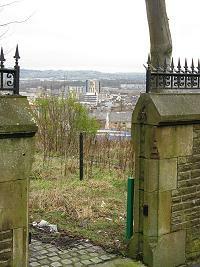 A Burnley Council plan published in 2007 proposed applying for a Heritage Lottery Fund grant of £180,000 to restore the Monument, but clearly this did not occur. The granite plaque on the monument. The bust is in a sorry state indeed. The monument, which since 1977 has been Listed Grade II as a building of special architectural or historic interest, was reported to have been vandalised at the time of a Listed Buildings survey in 1991, and the bust was recorded as missing at that time. Any information about its recent history would be very welcome. Information board at the Park entrance. A general view of the Park, which covers an area of around 8 Hectares. I'm afraid I left Burnley with a poor impression of the place, due to the weather, the poor state of the bust, and perhaps also the four men with sligtly threatening dogs that I had to get past on leaving the Park. I'll return one day, perhaps in summer when the tourist attractions are open; maybe the monument will have been refurbished. Written by Charlie Hulme. Last update May 2012.